The Port Range Forwarding feature allows you to set up public services on your network, such as web servers, FTP servers, email servers or other specialized Internet applications. Configuring the Port Range Forwarding feature of your router is made easy using the Linksys app. You can even set up Port Range Forwarding on your router remotely. Write down the IP Address of the client you will need to configure Port Range Forwarding for. Static IP Addresses should be assigned to the designated computers or servers before using the Port Range Forwarding feature. Tap on Port Range Forwarding. 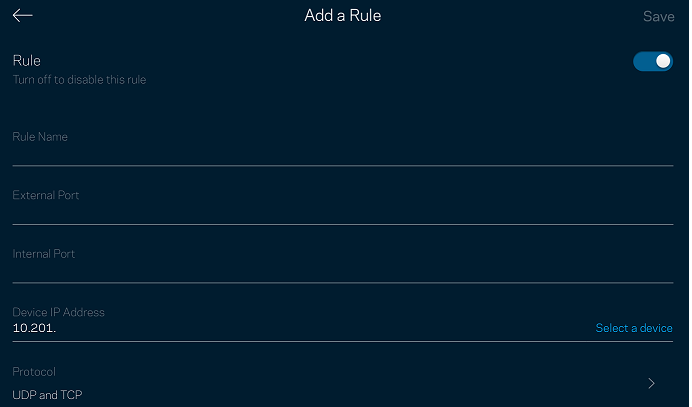 Tap on Add a rule. You have now successfully configured the Port Range Forwarding feature of your router.